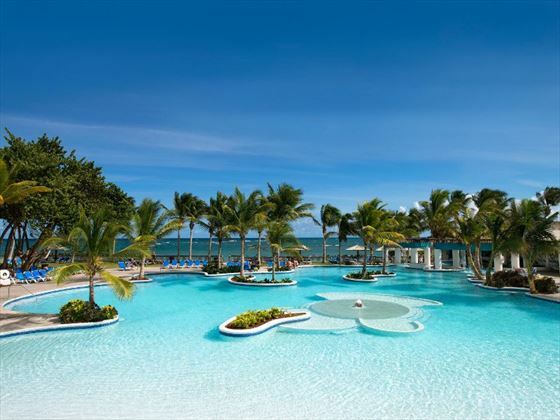 Spanning 85 lush acres fringed with coconut palms, the 250-room Coconut Bay Beach Resort & Spa is set along the exotic Savannes Bay on the island’s undiscovered south coast. Choose a variety of recreational sports for land and water lovers, for guests of all ages to enjoy. 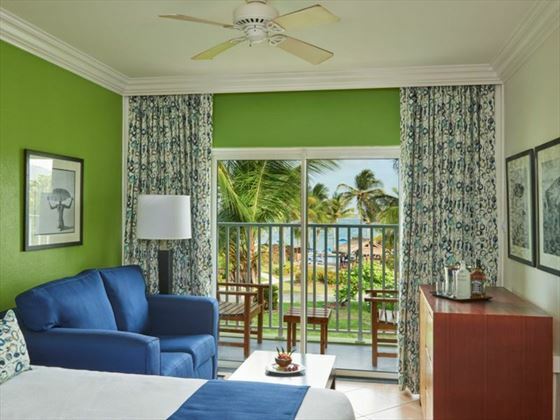 Coconut Bay Beach Resort & Spa is separated into two wings; one for adults only, the other for families. 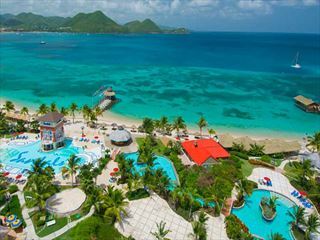 ‘Harmony’, the intimate adults-only wing of the resort, offers truly tranquil settings ideal for relaxing and enjoying the divine St Lucian weather. 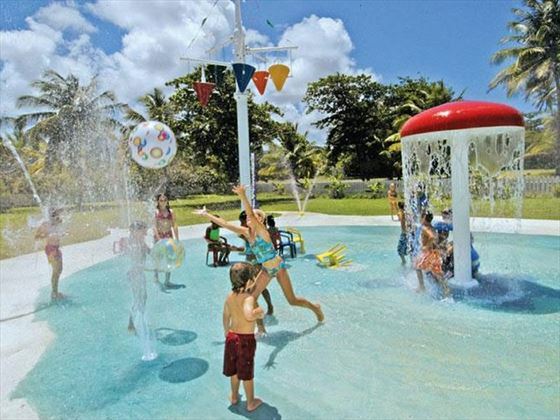 ‘Splash’, the family-friendly playground wing, features CocoLand, St Lucia’s largest water park and the Kidz Klub, ensuring that the little ones have the time of their lives, and that you can too. We love that Coconut Bay can serve every holiday palate. If you’re looking for a quiet and romantic holiday with your partner, there’s the spa and the pool to relax in. 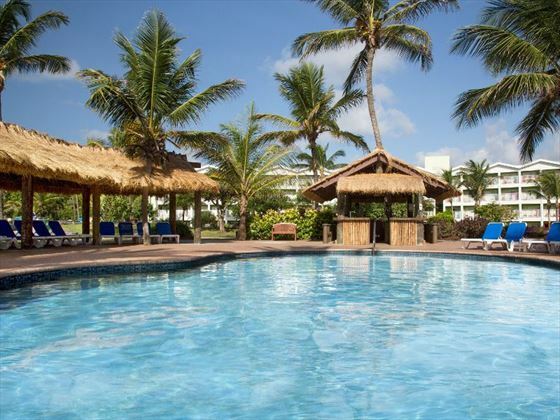 But if you prefer an active holiday there are opportunities for watersports, beach volleyball and aqua fitness. 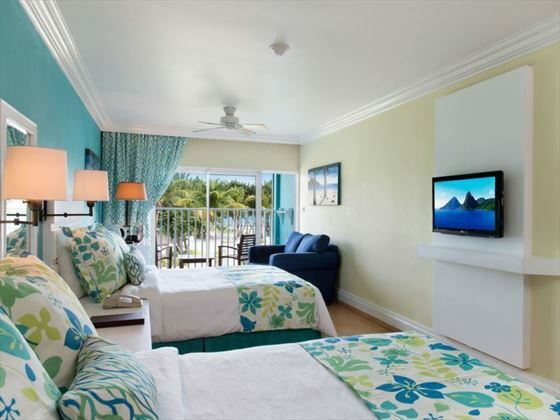 Top Tip: Upgrading to a Deluxe Ocean room provides you with those stunning views that Caribbean holidays are famous for. 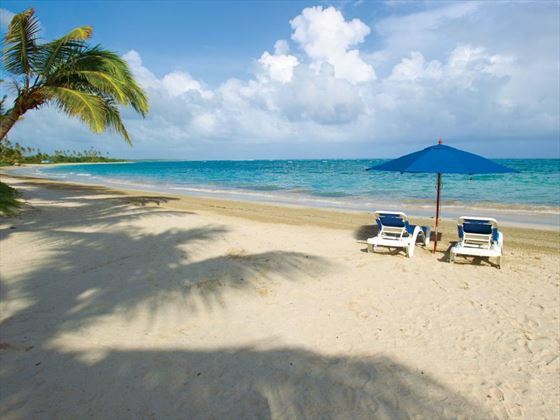 Further reading: Coconut Bay Beach Resort & Spa is featured in our guide to the to the top 10 honeymoon hotels in St Lucia and the top 10 family hotels in the Caribbean. 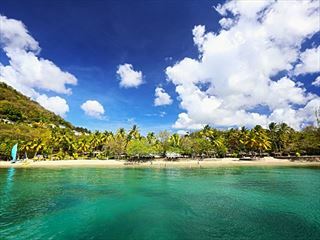 This delightful resort is located along the naturally stunning southern coast of St Lucia. 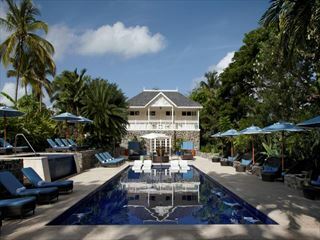 Perched along its own stretch of mile long beach, there's a wonderful exclusive feel to the property. 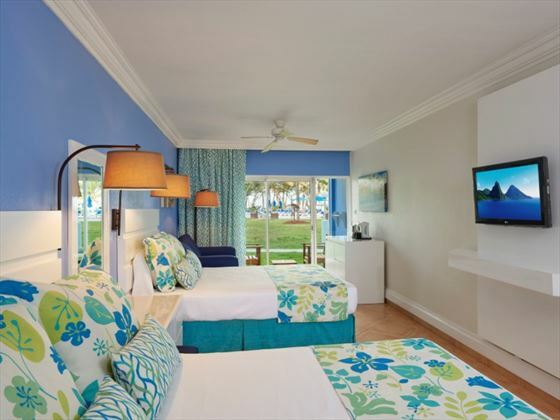 Deluxe Garden or Ocean View Rooms – Available on both Harmony and Splash wings; sleep either four adults or a combination of one adult and up to three children, or two adults and two children. Concierge Harmony Junior Suite – Available on the Harmony wing only, with stunning vistas across the sea, a stocked mini bar and a concierge service, as well as an invitation to a an al fresco couples dining experience. Two Bedroom Interconnecting Garden Splash rooms - Available on the ground floor of the Splash wing. 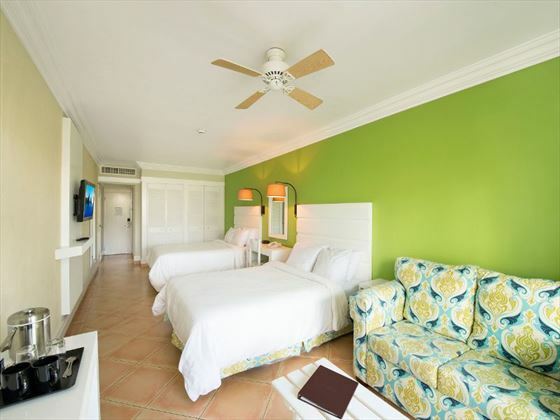 Two adjoining Deluxe Rooms that interconnect; sleeps two adults and four children. Honeymoon Concierge Premium Ocean View Harmony Room - Available on the third floor of the Harmony wing, with upgraded luxury furnishing and preferred dinner reservations; sleeps two adults. Reservations are required for Seaside, Calabash, Silks and The Greathouse which can be made at front desk or with concierge. When dining, closed in shoes must be worn, bathing suits must be covered and men must not wear tank tops or sleeveless shirts. After 6.30pm men have to wear long trousers and women have to wear dresses, slacks or culottes (no shorts or short outfits). 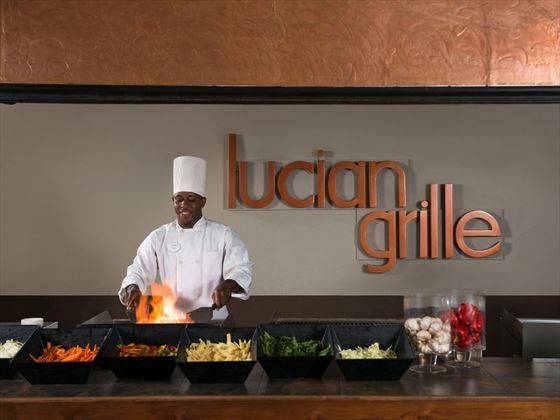 **Evening dress code only applicable in the Silk and Calabash Restaurants. The Splash Wing is designed with families in mind, providing amenities to keep kids and adults alike entertained. Parents can also now sign in and out of a local mobile phone, so you can enjoy the facilities of the resort safe in the knowledge that you can contact your kids at any time, and they can contact you. Coco Corral – Coconut Bay Beach Resort & Spa's latest addition, Coco Corral is a fenced in petting zoo with feeding stations to allow kids to interact with the animals, which include goats, ducks, donkeys and a horse! Kids who are registered with the CocoLand Kidz Klub can feed and visit the animals every day – a zookeeper is on hand each day to ensure the kids and animals are kept safe. Tokens can be purchased (additional cost) for animal feed. CocoLand Water Park – Located by the Splash wing, this features a lazy river, water slides and the Coconut Cannon water ride. Kidz Klub – A supervised club with activities to entertain younger guests, available for newborns through to 12yrs. 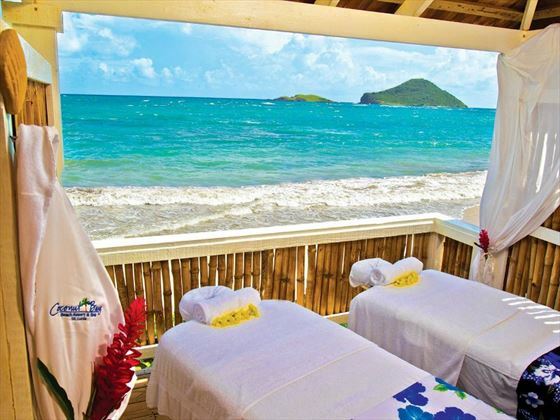 Nestled on the lush, tropical island of St Lucia, and set amongst 12 acres of gardens bordered by one of the most pristine bays of St. Lucia. 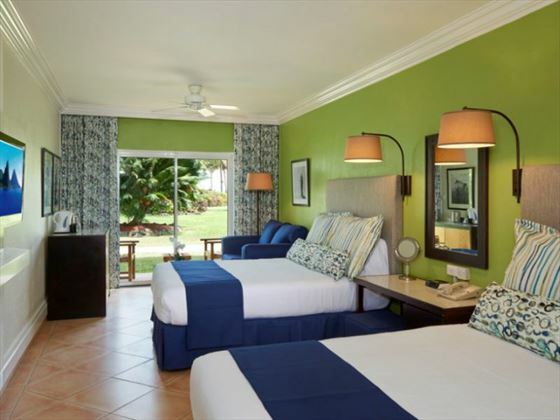 Rendezvous is an all-inclusive couples only resort set on a beautiful stretch of white sand beach close to Castries airport, and offers a relaxing and intimate holiday plus a great range of sports and activities. Rendezvous is the ideal romantic holiday.